That's us all done and dusted for the day. As F1 qualifying session go, that was a pretty darn good one, capped by an utterly stellar late lap by Lewis Hamilton, who pulled out close to half a second on team-mate Valtteri Bottas. But it's the gap to the Ferraris that is most telling - 1.1secs to Kimi Rakkonen and 1.3 to title leader Sebastian Vettel. The Scuderia will have their work cut out to finish anywhere close to the Mercedes if that pattern continues. But this is F1 and anything can happen, so join us tomorrow to see what, er, happens. Until then, here's Andrew Benson's qualifying report. Kimi Raikkonen, P3: "Obviously it's better than I've had, but I was struggling with the temperature of the tyres. Luckily the last set had a better feeling. We are close enough." Valtteri Bottas, P2: "The lap in the end wasn't quite perfect, I was struggling with the front-left temperature. Disappointing, but second place is not bad." Lewis Hamilton, P1: "That was one of the most exciting laps I've had all year. A lot of pressure as we've been struggling with getting temperature in the tyres, I was just praying it was enough. "I'm so pumped with that. Our team worked hard to get us back out there for one last lap. Amazing." Sebastian Vettel can only start fourth after a really tough day. Decent damage limitation given his earlier engine change. But that gap of 1.3secs to Hamilton is ridiculous. That's a 66th career pole for Lewis Hamilton - beating the mark of his hero Ayrton Senna and now just two behind Michael Schumacher's all-time record. 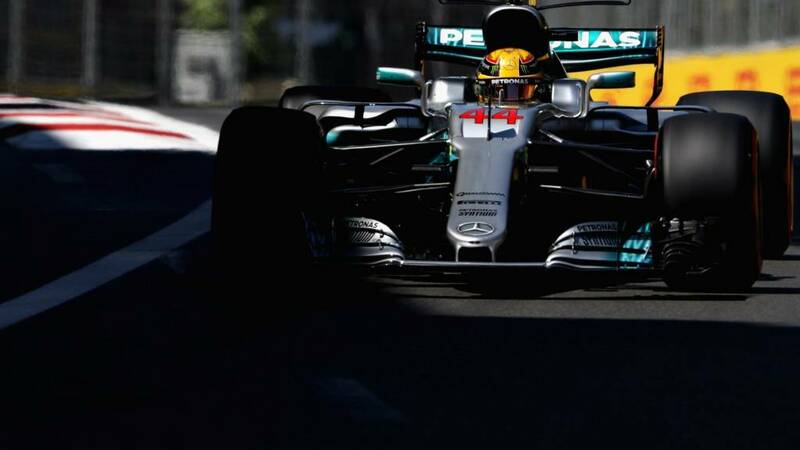 LEWIS HAMILTON TAKES POLE POSITION FOR THE AZERBAIJAN GRAND PRIX. BUT HAMILTON DOES A 1:40.593! Raikkonen takes third place - a full second off Hamilton's pace! Bottas quicker than Hamilton in sector one. Looking good for the Finn so far. So the drivers are going to have one shot at this. Actually, I'm just hearing Max Verstappen might have enough time for two laps. Could be crucial for him. The lights turn green and we're off. 3:33 to get this thing sorted. Session to restart in one minute. Right now Bottas is in the prime position. With only 3:33 left, it takes 1:50 to do a lap but tyres are cooling down, so the chances of anyone beating him are slim.